hi everyone, i just recover from a desktop hijack. 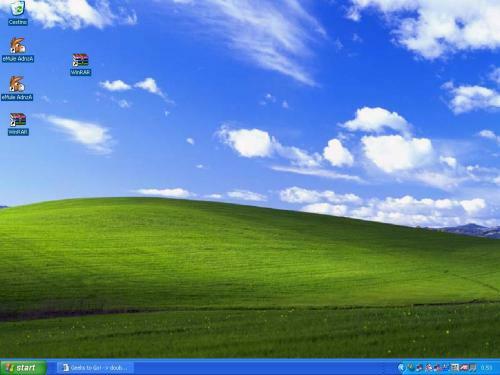 my desktop was like this picture . i clean my pc,removing all files created by this malaware, but two things of the desktop dosn't still work every icon i place on desktop is cloned, so i have two ie icon, 2 documents icon and so on.... the other things is that also if i enable the transparent background text icon they still appear like if it was disabled. If i create a new desktop none of this problem are present but i need my old desktop, so anyone can help me? sorry for the pic i make a mistake. my desktop is like this ; if i browse the dir C:\Documents and Settings\Filippo\Desktop i see just one icon per program,as normal. Done but nothing changes, i still have doubling icons and that awful blue rect round the icon text. Right click MY COMPUTER< choose PROPERTIES< choose ADVANCED, choose PERFORMANCE button...choose adjust for best appearance.....reboot. What the heck is that danger spyware image? Is that a program? Or a browser pop up....? i get a spyware or something else and my desktope changed like the pic of the danger spyware, the the right click was disabled and i cannot change the wallpaper. then i removed the spyware, following another thread of the forum and i could correct the right click of the mouse and the desktop, but once restored the desktop has the doubling icons and the rect. done , i have also disable active desktop and freeze icons. Create a second user account and log into that....does the problem repeat in that account? for the new user the problem doesn't appear. the strange thing is that i have just one of every icon, which was on my original desktop, even if in the new desktop i don't put anything of those programs. maybe is a key in the registry?